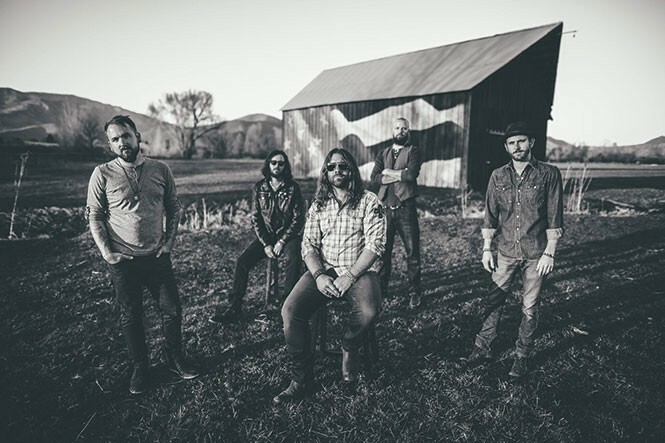 After 18 years, SLC rockers Royal Bliss go country with new EP, The Truth. w/ Royal Bliss, Candy's River House, Wayne Hoskins Band, School of Rock. After-party w/ Candlebox, Berlin Breaks. 3 p.m.; after-party 10 p.m.
From the very beginning, Royal Bliss was serious about making a career in music. Still, singer/guitarist Neal Middleton says, "It's so much more than I thought it would be." Their story has been more than just "local band makes it." It's also a kind of roadmap—if there can be such a thing—for musical success in the digital age, and a tale of overcoming seemingly overwhelming obstacles. When they played their first shows in 1997, Middleton was barely out of high school, and he says he was lucky to have a friend to "teach him the ropes" about all aspects of being a band, like playing gigs, talking to clubs and assembling a press kit. "Once I got the addiction for being on stage and performing," he says, "there was no other option." So the band set about "building a fan base on shameless self-promotion." Royal Bliss gave away hundreds of their first CDs, and tickets to their shows. Eventually, they started getting local airplay, which spread to Idaho, Wyoming and, later, the Midwest. Investments from friends enabled Royal Bliss to get the attention of several major labels, ultimately signing with Capitol Records in 2007. But it wasn't all rosy. When Capitol's parent company, EMI, consolidated a number of labels, cutting numerous artists, the band was able to get Life In-Between (2009) released on Merovingian Records, and it debuted at 151 on the Billboard 200. Even before that, the band had their share of hardships. In April 2004, Middleton fell from a 35-foot tall balcony in Long Beach, Calif., and was paralyzed. He taught himself to walk again in three months in order to play a comeback show in Salt Lake City. "Our only form of income was music, and that was a driving force," he says. During the same period, drummer Jake Smith rolled his car, and then-guitarist Chris Harding put a ski through his face in an accident. These events birthed the albums After the Chaos and After the Chaos II, the latter yielding the single "Devils and Angels," which charted and led to their Capitol Records deal. After their experience with Capitol, the band founded their own label, Air Castles, and returned to handling all aspects of their careers, and even opened their own club, The Royal. Now 37, Middleton believes their stylistic journey has echoed their personal ones—from the reggae rock of their partying late teens to the almost heavy metal of the After the Chaos period when "real life happened"—and now country rock seems to fit his "married with children" suburban lifestyle. Royal Bliss's new five-song EP The Truth is a country-rock search for salvation. "Now I live in the suburbs, with a wife and two kids," Middleton says. "After all that angst, I realized I'd rather be happy. The music's turned more toward love and positive vibes." The band received songwriting assistance on three of the tunes from their friends, Monty Powell and Anna Wilson, who've written for Lady Antebellum, Keith Urban and Tim McGraw. The title track finds grace somewhere between the bottle and the Bible. "We're Livin' the Dream" might be the group's theme song, except it's about the too-short weekend that caps off the 9-to-5 daily grind. The music video recently premiered on country music cable channel CMT, and Middleton says the band will perform on "five different Live Nation country festivals from The Gorge to the MGM Grand in Las Vegas." They'll also be on the bill for the Country Fan Fest in Tooele this July. Like the rest of their music, it's mainstream, but it's what Royal Bliss has built their success on: being eminently relatable, with a familiar sound. Middleton says fans often tell him "this song changed my life," and that makes it worthwhile, even if they aren't getting rich. More than anything, Middleton says Royal Bliss' story is one of sheer determination and work: "Persistence has been the key."